Presenting Sun Escora, an enclave of premium apartments and independent villas in Socorro, a pretty isolated village in Porvorim, North Goa. Landmarks nearby includes Holy Family School (2 km), JMJ hospital (1km) and Socorro Church & School 500 meters. Oriented on a hill the 2 BHK apartments are cozy units configured over duplex buildings and comes with 4 balconies per unit, while all the 3, 4 & 5 BHK villas get excellent valley views, and have a fresco sitting, plunge pool, family room, maid room, maid's tolilet, terraces & car parking. 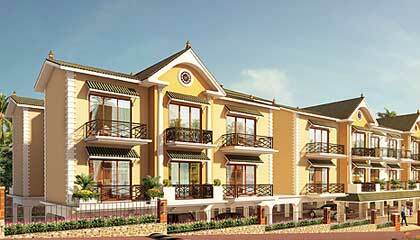 Sun Escora also comes with supreme lifestyle amenities that includes sports, health as well as entertainment facilities. Located on the North Bank of the Mandovi River, Socorro is far removed from the city madness, and yet, is surrounded by hospitals, restaurants, colleges and other facilities. The most popular beaches of Goa are also a short drive away. The main attraction here is Our Lady of Socorro Church.